January 1st in WordPress Themes by Wordpress Jedi . Putting together a conference is not as easy as some make it look. You will have to do your homework to make sure everything goes according to your plans. Building an attractive website to promote your event online is important as well. The Meetup for WordPress can help. It is a commercial theme for conferences and small events. It has a responsive design and offers event/speaker/sponsor management, a page builder, and a customizable look. The Meetup theme has multiple blog layouts. With its drag & drop page builder, you are going to have an easier time customizing your website. The theme has over 35 content elements for you to choose from. Adding your logo and changing theme colors are easy. The Meetup comes bundled with LayerSlider. 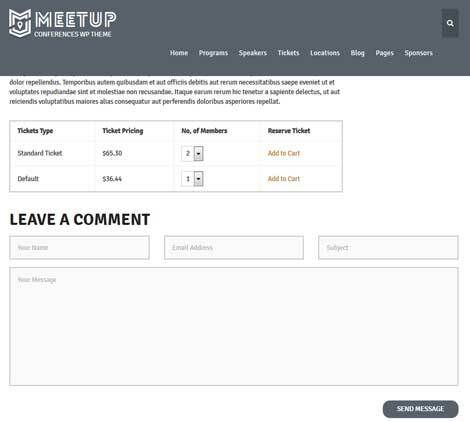 The Meetup has various built-in shortcodes. You also get over 800 Google Fonts to choose from. The Meetup is coded in HTML5 and CSS3. This is a commercial theme by an Elite Author.